Can SEO Companies Be Trusted? I think NOT! and other search engines. These companies charge you an arm and a leg for their services. Unknowingly, many businesses buy into these services and they spend a good deal of money doing so, but the returns they get are sub par…if anything. 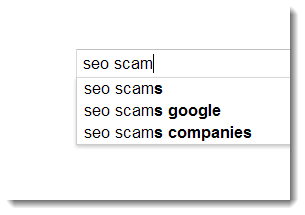 In other words, there is a big SEO scam ring taking place out there and you, the consumer needs to be aware of this. And because of this I want to cover one of the biggest scams that exists in the online world, SEO Companies and Services. If you are a legit service and you truly understand SEO, kudos to you (I am not speaking to you). If you are service that preys on unsuspecting businesses that are in dire need of rankings, SHAME ON YOU. I am going to be calling you out in this post and I am going to use some real life examples to showcase the unethical stuff going on out there in the SEO world. The Best SEO Companies, an OxyMORON? The problem with SEO, is that there is always a very large crowd chasing the “holes” in the search engine ranking system. Search marketers and companies find these holes and they build businesses around them. 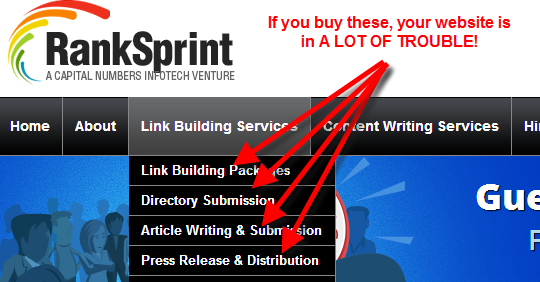 If you have ever heard the terms “backlinking”, “article submitting”, “keyword density”, “link popularity”, “page rank” or “auto submission”…these are the exact techniques I am talking about that companies try to capitalize on. The problem is that these techniques work only temporarily. They find a flaw in Google or another search algorithm, they expose it, and then they are able to get temporary rankings. When Google releases an update like Panda or Penguin (which are improvements to their search), any website that has used these techniques gets completely de-ranked (also known as sandboxed) from Google and they cry “shame on Google”. But really, it is shame on them and shame on these companies that are charging for these services. Here is an example SEO package, which is essentially a backlinking system that attempts to “trick” Google into thinking your links are natural and that they are valuable (it no longer works). 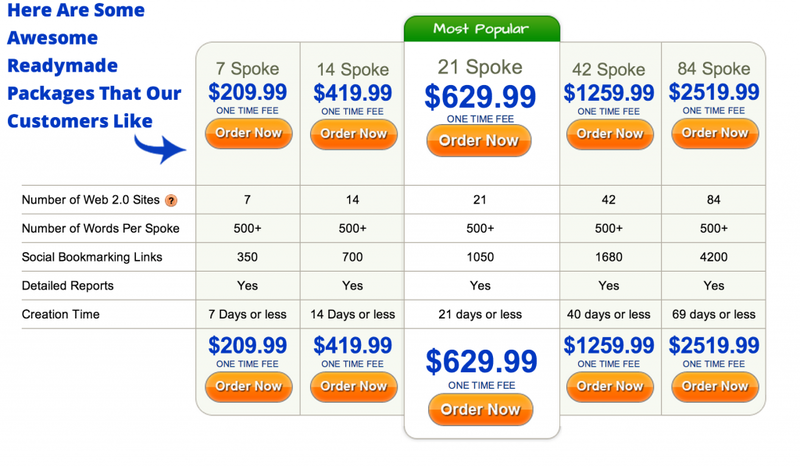 You can see an 84 spoke linkwheel (a lot of useless jargon) is just $2,519! LOL. And guess what would happen if you bought this package? You would in fact LOSE all of your rankings in Google. Google would also likely red flag you, your site, and your future activities within the search world (perhaps not instantly, just when they found what you are doing), and your domain would become useless. But here is where it gets really nasty. The SAME SEO companies that offer link building services (and the likes), often times offer link removal services when you realize that your backlinks have killed your rankings. This is like me going up to you and breaking your arm, and then offering you a cast to fix it. Insanity, unethical, and this sort of thing should be frowned upon….but this is what is going on out there! Wake up to this scam people! SEO Firms DO NOT Know What they HELL They are Doing? You think if a company labeled themselves as an SEO company should know what they are doing right? 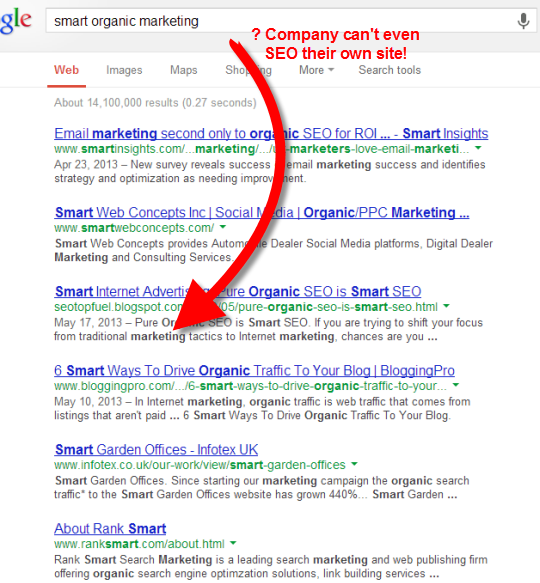 How about a “smart organic marketing” company, they would be good at organic marketing (another way to say SEO) right? You would be wrong with this assumption and I have some really interesting stuff to validate my point here. The other day, someone brought this company to my attention. They were called SmartOrganicMarketing.com, they are an SEO company that is dedicated to helping people get high rankings in Google. The price of their services, $5,995! What a bargain. For a company with a decent sized budget, this actually is quite affordable. But in order to validate a price of this amount, this company better know what the heck they are doing. The best way to test this out…to see how well “they” rank in Google. So here is what I did. I searched their branded search term in Google: smart organic marketing. This should be an absolutely SIMPLE term for a company with the .com domain to rank under, in particular one that apparently are SEO experts. Smartorganicmarketing.com was nowhere to be found. In fact, that exact search term only had 16 other competing sites in all of Google. Nothing. I took this one step further and put this into Jaaxy.com’s SiteRank tool which instantly scans the first 20 pages in Google to see where a site is ranked. Still nothing. After a bit of investigation, I found that this “SEO” company is not even ranked at all in Google. WTF! So this so called SEO company is trying to charge other unsuspecting folks $5,995 for their SEO services and they don’t even know how to SEO their site under their OWN search terms (which have next to no competition). This is the exact reason you have to be really careful when looking to get SEO help and why I don’t recommend that you get high priced help from SEO companies of this nature….a good deal of the time they end up being a complete rip-off. Sometimes they will even outsource their SEO work to someone else who claims they know SEO. A vicious cycle. You cannot turn SEO into an independent process, in other words, you cannot effectively source it out to other companies. The reason for this is that your website content IS your SEO. If you know how to deliver quality content, you will get rankings. If you know how to speak to your audience, you will get rankings. Essentially what it comes down to is that if you are a credible source of information within your niche, you will be able to get rankings, attract a following, and spike your search engine rankings (which is going to lead to more traffic). Do you think another 3rd party company knows your product/service better than you? Think they know your industry better than you? I think not. Gone are the days of treating SEO as a peripheral process and being able to source out backlinks, content creation and submission, and automating SEO via submission, spinning and other low-grade tools. That stuff doesn’t work…and even “guest blogging” (which has gained popularity recently) can lead to POOR results in Google, adversely impacting your rankings. Perhaps this “outsourced SEO” approach may have worked a few years back when Google was just learning how people were gaming the system with backlinks, guest blog posts, spinning content, press releases, etc…but with the latest updates, they have done a 180 and now punish sites that do this, often times REMOVING THEM COMPLETELY from their search rankings. You don’t want this do you? Didn’t think so. In saying all of this, there is hope for you and your SEO regime. If you want your company to have a successful presence in the search engines, you should take some time to understand SEO. When you understand a process as important to your online success as SEO, your company will naturally be that much more successful. That is why I absolutely recommend that you get some real SEO education versus simply handing over a check to a company that may or may not (mostly may not) be credible. You should take some time to answer these questions. Why do websites get rankings in Google? What sort of content do I need on my site? What is Google looking for when they rank sites? What really is an SEO service going to do for me? If you can’t effectively answer all of these questions, then you need to brush up on your skills and work on developing knowledge as to how SEO works. It actually is not going to be that tough and I want you to get an education in SEO from folks that are on the ground and that know how SEO works in this current age of the Internet. So, in summary. Watch the HECK OUT for companies offering SEO services. They are usually in the business of making money offering a low grade service. AND spend some time understand how SEO works via a credible source. Don’t hand off one of the most critical aspects of your online success to somebody that could end up doing more harm than good. I hope this has been an eye opener for you and if you do have any questions pertaining to SEO, I would love to help you out. Leave your comments, questions and opinions below. MDZ, a Canadian firm, hides the prices in an effort to dupe rubes into their scam. Thanks for letting me know, I will definitely investigate this company and do a thorough review on them. I hate to hear when people are getting scammed by companies like this and there just happens to be so much of this going on within the SEO services world. Also beware of people who want to manage your PPC. They are merely RE-sellers of Google AdWords, etc. If you deal directly with Google, when no one clicks, you don’t pay. In managed PPC campaigns, you pay a flat fee – every click you DON’T get, they make money on.!! Absolutely a good point Michael. PPC management companies are the grime of the industry, taking up to a 50% cut on top of the advertising fees, using these sort of companies are a good way to “waste” money versus learning how to properly use Google Adwords in house. These PPC companies have a tendency to go after higher bid prices and higher volume traffic keywords (which are both bad approaches) just so you spend more and they can earn a bigger cut. I do SEO for a living and I can tell you – most outfits can not be trusted. Since SEO is an ongoing, or recurring agreement, many that don’t have recurring contracts want in. Many are “big box” agencies that impress prospects with a client list built on print design, packager design, etc. – totally unrelated skill set. Buyer beware, and if you find a good one that doesn’t demand your firstborn, treat him good – they are rare. I couldn’t agree with you more Michael. They build their SEO clients based on past clients versus what they can actually do. I have worked with and helped too many people that are in a “recovery” situation because their SEO companies that they have paid $1,000’s have destroyed their SEO. Thank you for the nice article, could you give the link again to get trained on SEO? What about PPC campaigns, would you recommend having a company managing it? Is it the same story as SEO companies? The training within the Getting Started Course inside of WA will walk you through the SEO process and as you move through the levels of the training, it will get more advanced. Thanks a million for the information in this blog. After being ripped by a couple of SEO companies we are searching for a reputable firm/individual that can help with content marketing and everything else that Google recommends doing. Can you tell me if marketersbraintrust f/k/a seobraintrust is legit and therefore worth hiring? Can you publish a list of reputable seo/content marketing firms here or email them to me? In most cases, you are going to be overpaying for these services Eric. If you are trying to get your website or local business ranked, it is best to learn the process yourself. It is not all that complex and any company claiming they will get you ‘quality’ backlinks and citations, are companies you want to steer away from. You can accomplish this yourself in a much more cost efficient way. I would be more than happy to help you out with this within Wealthy Affiliate if you like (create a free account here), totally free to get started and you will be able to communicate directly with me over there. We have an abundance of local marketing and SEO training that actually works and can be implemented directly by you, without the overhead of paying into these over-priced and often shady SEO companies. Yes, I know this from my own experience. I had my website in 2001 and paid SEO company. What happened? Nothing. Thank you Kyle for this great post. And worse than nothing happening, many SEO companies will actually hurt your rankings. I am starting a web design company. I have done freelance work in the past. I want to offer SEO services to my clients. I would prefer to refer them to WA to learn it for themselves, but I find most prefer to let others handle that. For the record, I use on-page SEO and content creation for results. I also use Street Articles and the occasional HubPage to refer traffic. How do you recommend that these services be marketed? You say that $600 a month is too much. Even if you are providing quality content on a daily basis? It takes a lot of effort to write all of that content. It takes a lot of effort to ensure your sub-contractors deliver a quality product. Could tell us what you think content-based SEO services should cost? You are different April, you understand the fundamentals of SEO and the proper techniques to get pages ranked (because of your training). If you can provide $600 per month per value to a company and you are offering them $600 worth of service, by all means do this. Some companies are not willing to (or don’t have the time) to learn this stuff and there is nothing wrong with charging for your services and knowledge. I am interested to talk more with you about the SEO that you offer. Do you have a number/ email address I can contact you on? We teach SEO the proper way. If you are interested in learning how to get ranked in search engines, I do recommend that you at the very least take us up on our Starter membership (completely free). If you have any more questions moving forward, you will be able to ask me within WA (as you can connect with me there) or if you have any specific SEO questions, I can help you out here Angel. Do you have any articles on those all in-one E-commerce sites like Volusion or Bigcommerce. I have a site on Volusion and yes I haven’t done keywords for all my products or added products to all the categories but we still don’t get much traffic and don’t know what is wrong. Volusion wants about $600 a month to SEO my site. The last 4 months has been hell working with Freelancers to edit our online store. When Volusion wanted a little more money but in 1 week my site would be complete. Should I use them to SEO my site for about 3 months and see if I get any results during the Christmas season on Snowboard gear for example. just looking for your thoughts on this company. No, you absolutely shouldn’t. You should learn the proper SEO techniques yourself and you will be MUCH more successful with your website. Companies like this are a complete scam in my personal opinion and I am not sure what they are offering for $600 per month, but that is far too much money for something that you can learn yourself. That is a true sign they are using “dated” techniques and they will likely just end up taking your money with little results. If you want some real training and real help with your business, I could offer you TWO years of education, tools, expert help, and the ability to network with million dollar entrepreneurs within Wealthy Affiliate. At the very least, check out the free Starter membership, you will be glad you did. Obviously your Search engine optimization is pretty good since I found this site! I 🙂 I’d really appreciate it if you could write some articles on SEO and divulge some of your strategies and techniques…that would be awesome Kyle. I definitely speak about SEO on a regular basis and will reveal some of the strategies here within my blog, but if you want a true education on SEO and want to learn how to get properly ranked in Google, I suggest you join me within the Wealthy Affiliate community the top education platform out there on SEO and many other subjects related to running a successful business online. Excellent article Kyle. You should consider calling out some of these so-called “gurus”. Take apart there systems and expose the legit ones from the scammers. Actually I think I will do that too. Definitely will be part of the plan moving forward Troy. There are far too many people getting “taken” by programs out there and it is time that many of them become aware of them before they end up investing their hard earned money. I hope this really helps folks realize the scams taking place in the SEO industry and think twice about paying companies for their SEO services. Obviously your SEO is pretty good since I found this site 🙂 I’d really appreciate it if you could write some articles on CPA networks. Even some of the bigger ones have problems. If not, continue what you’re doing man. I definitely will George. As time goes on I have plans for a lot more content, many more reviews, and I plan to help a lot more people get moving in the right direction online. Frankly, there are too many people giving “poor” advice out there and there are enough scams and hoaxes out there to keep me busy for a lifetime. Thank you very much for the time you put in for this great content that keeps reminding us what SEO is all about these days. IMO, search engines have become very sophisticated the last few years and this is leading us all into one simple direction or strategy for our online business: quality, frequent, relevant content! To tell you the truth, I feel kind of free with this “new strategy”, this new approach to SEO! I never tried to game the system completely, forgetting my readers and their expectations out of my content, but I did use to strive for backlinks, spin my content and submit it for off-page optimization, pay for social bookmarks and spend hours and hours on this “SEO work”. Now I can spend all this time writing more and more quality content focusing on content marketing techniques like the one you demonstrated to all of us very naturally and elegantly in your last paragraph. English is not my native language Kyle and this means that if you need 15 minutes to write this very nice article of yours, I would perhaps need twice that much. So keeping my SEO strategy as simple as it is supposed to be (writing naturally flown content that provides solutions to people’s problems or questions) gives me more time to focus on writing more content. Absolutely, they are getting more sophisticated with their knowledge of human language. If folks don’t think that Google Docs was created in part to understand human language and how people write, then they are fooled. Google knows what they are doing and they are getting a better handle on how to find quality content, which has nothing to do with how many links you have going to your content, how many times you say the keyword, how many people Facebook Like your content. It comes down to the quality of content. One thing that has remained a complete “static” over the years is the fact that although Google changes, they have always sought out the highest quality user experience, which means finding and ranking quality content. Follow that and you will be successful in the long term within search engines, in particular google. Love your article. I am one of those guys that got suckered into paying 5 grand for SEO services and also for 15 keywords to be ranking on the 1st page of Google. In 12 months NEVER HAPPENED! Matter-of-fact Google has no idea that my website letsgocampgear.com even exists. I get even more calls from different companies wanting to sell me even more SEO services. There are some silver tongued devils out there that are very good at selling bad services. Sorry to hear that you succumb to one of these SEO operations (there are many out there). By offering your story here, I know that you are going to help prevent other folks from getting sucked into these high ticket SEO services…so I do thank you for that. Unfortunately, the SEO world is like the “social expert” world…these folks have no idea what they are doing but will sell you on the idea that the know. If anyone is trying to sell backlinks or article submission services (mass), it is a sure way that they are offering a service that is outdated and will only end up hurting your business. Hopefully with some awareness folks will not get taken in by scams like this going forward. The SEO Business is a Very Simple Business. You pick the proper KW. Kw’s are nothing more than a person looking for an answer to their question or their request for information. When you write content… if it is solely focused on providing the answer to their question or request for information;it is of good interesting quality, then your SEO job is complete, and now you search for more questions (KW’s) and and write more content. I learned from two of the best in the industry. Now if they just knew how to pronounce “niche” it would be all be good! Well said Ronny. SEO is simple if you make the focus of your activities the “recipient” of your content, not how the actual search engine algorithms work. The fortunate thing for those of us that get it is that there will always be a large percentage of so-called SEO experts chasing search engine holes and getting burned as a result. I can understand your rant when you can prove this much of a scam. Unfortunately scams will always be on the internet. Neither Google you or me will stop them. Hopefully people will do their due diligence BEFORE taken out their credit card!!! You are right, we cannot stop them but we can absolutely do our best to bring them to people’s attention. Hopefully everyone that reads this will do their due dilligence when considering an SEO service, and ideally will take the time to learn how SEO works themselves. Too many people source out the CORE component of their businesses..and in the case, to companies that will end up costing you even more business as a result! Very insightful. However, without backlinks, there is no getting traffic from Google. I’ve tested it. New websites don’t appear in Google even for the most obscure keywords – even for 5-word keywords with a <50 QSR – until they start gaining backlinks, whether naturally or artificially. So should we be creating content and waiting for months and years hoping that some authority sites in our niche link to us, or should we be buying backlinks and dominating the SERPs in weeks or a few months? Everyone builds links one way or another. Heck, even big online shopping sites like Amazon and Overstock have an SEO team that build backlinks for them because they want to rank above their organic search rivals. I think backlinks will remain unavoidably instrumental for high rankings for a long time to come. Charles, unfortunately I have to say you are 100% incorrect. Backlinks are by very nature, BAD these days in respect to search engine rankings. Google has made strong announcements in respect to this and I do suggest that if you are following folks that are still preaching the benefits of backlinks, you consider finding some new and reputable friends within the industry. I follow several popular blogs about internet marketing (just like I follow yours) and their owners publish case studies sometimes where they rank websites in Google using backlinks (the same thing SEO companies do) and they usually get to #1 in Google in less than 3 months. I don’t want to go to extremes to assert my opinion, so I won’t mention the URL of those blogs here. I can tell you it is possible and I see folks out there with “backlinks” dropping like flies around me and those people that are taking the approach of quality content, succeeding like crazy. It is NOT NEW that backlinks will hurt rankings, Google has been slowly punishing sites with heavy backlinks for quite some time now. In recent years, I have completely dropped backlinks from my SEO agenda and rankings have never been better or never held as long as they do. Thanks Kyle for pointing me in the right direction. No problem Charles, if you ever have any further questions about SEO do let me know or get in touch with me inside of WA! Lots of great information here to digest and mull over. Thanks for going to the time and effort to keep us educated! No problem Deborah, glad I could add some clarity to the SEO world for you. It has crooks just like any other type of business. Great info Kyle! It’s amazing how much people pay for someone else to do SEO, especially without checking out how much this so called SEO site actually knows about SEO first! What a shame actually. It would make me wonder why this company’s site doesn’t even show up in Google, but is saying they can get my site ranked high. You’d think at that price they’d check at least that before paying for their service! Nothing surprises me anymore to be completely honest. I see vultures like this all around and it dilutes people’s trust within online businesses. There are SEO companies like this everywhere, but that is just the start. There are companies and affiliate trying to promote the idea of mass backlinks (which will do more harm than good), automated tools and services for SEO (which don’t work), and expensive coaching programs where the people teaching have no idea what they are doing. The quickest way to see if an SEO company has a lick of knowledge, is to research their own optimization. You will find more often than not they have no idea what they are doing. I get so much spam from these companies. I ignore them all. I have always relied on the information you provided in WA training. I steer clear. By the way, I don’t know if I consider bringing this to my attention a rant. Awesome service you provide, my friend. SEO companies that have to spam you should say something about their ability to market online (it is null). The only reason I call it a rant is that it is just another one of those things that frustrates me about the industry we preside in. The faceless Internet where folks get away with what I think is criminal activity and they think it is OK. Just because you SAY it’s a service, doesn’t mean it is actually a legitimate one. Avoid these companies at any cost (and definitely do your due diligence if you do decide to go with one), more often than not your business will actually be WORSE off from using them and you will be out a bunch of money. Ha! This is a great article and I’m an SEO guy. Many of us in SEO have used the tactics mentioned and many black hat techniques to get sites ranking. The fact is the game has radically changed over the last year and it’s no longer easy to get sites ranked organically. I’m always looking for the best and safest way to help clients. The truth is I no longer want to take on the low hanging fruit clients that are looking for cheap SEO. This process is much more involved now. Depending on your niche could take a lot of content to get you ranking. I happened to look at one of my own review sites that I don’t put much energy in today and wow it’s ranking for 41 keywords with only adding content to my surprise. I have done nothing else and actually forgot about the site. I wouldn’t say the content is awesome either. On the other hand, my NEW SEO site that I’ve been trying to get bugs worked out on since it was delivered to me in January isn’t ranking a single keyword. Again I’ve done nothing but add content. No backlinking although I do have some links. My own SEO industry will be the toughest of all niches to get ranking because of the competition. Not to mention the lack of work and newness of the site. Truth is most of us working for clients don’t put that much time into our own sites. I have 10 sites and thought I was done with affiliate marketing before seeing one of my sites actually gaining in the serps over the last month. I’m a member of Wealthy Affiliate and SEO BrainTrust and both are very reputable. Yes, it is difficult for me to not use old techniques. I’m no longer spinning articles for syndication and have stopped many other techniques that were achieving great results last year. Now I’m looking into repost.us and streetarticles.com but not sure how much they actually help sites. At the end of the day we are all gaming the system in some way to get sites ranked and we have all have had our successes. Figuring out how to get sites ranking is what we do and there are bad guys and good guys in every industry. I’m always looking for the best and safest way to help clients. Then content should have always been your focus. This has always been and will always remain the safest way. There has been one static over the years in respect to what Google is looking for, quality content. Every SINGLE one of their algorithm changes has been in attempt to remove low quality content in order for the high quality content to move to the top. Yes this definition has changed to those trying to game, but to those creating quality content from the start have not seen anything but more traffic with every update that Google rolls out. My own SEO industry will be the toughest of all niches to get ranking because of the competition. The competition? Did you not read the post lol. Yes, there are some really smart folks in the SEO industry, but a good deal of your competition has no idea what they are doing. This is good for you and if you understand the process of SEO, you will get rankings within any industry. Some say the “make money” industry is a difficult one to get into, but I would beg to differ. It is quite easy…when you understand SEO. If that is your approach, you are going to have some very unhappy clients. Sure they will be happy when a gaming technique works temporarily, but when it ends up collapsing their entire online component of their traffic, they are not going to be happy with you. This is what I call chasing holes and NO, not all of us are gaming the system. Some of us simply deliver what our audiences are looking for, the SEO results do follow. I have seen it over and over again…and I have also seen those that don’t believe me with my statements against “gaming techniques, come back crying when their sites disappear forever from Google and other SE’s. In saying all of this, I think you are one of the good guys within the industry and you will only become better if you follow the principles of the audience, versus that of the SEO world. The SEO world has no principles. Okay Kyle, I’m going to dig into WA more and see what I can learn from you. Internet Marketing is always changing and I’m always learning. I guess the content thing has not changed because I have been hearing that for years. In 2007 I built my first blog and was told to add content. After 10 articles I was a little burnt out on telling people how to buy or sell a business. Along the way I found a book ‘Search Engine Optimization an hour a day’ and applied those methods and was quickly ranking. Then I found India backlink teams. The final magic bullet was an ebook called fast track SEO but now most all that can be detrimental to a site. I get it. It’s content but still have trouble believing it. I do have content written for all my clients and manage the content. PS Maybe you can recommend some advanced WA training without me starting at how to setup a website. I’m sure all your training would be helpful. Sounds Steve. The internet is always changing and that is why it is such an exciting place to be! 🙂 But in respect to SEO, one thing that has never changed is Google’s goal with their search engine. Quality user experience. To achieve these, they need to deliver the highest quality results which means the highest quality content. There are holes that are always created within their algo and those are patched up eventually as they find that people can game them. First it was meta tags, then it was density, then it was length of content and type of content, then it was backlinks, then it was in bound anchor text links…but as we move forward, it is becoming more and more centered around content. Those that have produced quality over the years are seeing the biggest improvements they ever have with each Panda or Penguin update, those that are buying backlinks are basically ending up in one big unhappy sandobx. We have an entire classroom within WA dedicated to SEO (in the premium membership) and I recommend you check that out. We also have hours of recent video on it within the Live Video Classes. Everything you need is there and if you have any questions, just ask for some support.